I was recently at a Gordon Research Conference (GRC) for a field I am tangential to and want to learn more about. If you are in science, and don’t know what GRCs are, you should. They are small conferences on more focused topics. The one I was at can only have less than 200 participants. That means you can talk to many people deeply about science. Further, the GRCs are structured such that the afternoons have free time for you to socialize with the participants. I think that socializing in this way is essential for networking and forming stronger bonds, perhaps even friendships, with people in your field. At the GRC, there is only one session at a time (no concurrent sessions) and long discussions afterward. The GRC is good for learning science without getting overwhelmed or worried about not going to the right session. So, if you are a student or postdoc, especially, you should ask to go to a GRC. I think they are especially good for your career. But, this is not the point of this post. The point of this post is to talk about talks. I think a lot about how best to present my work to people. Even if my work/publications are boring, my talks never are. They get people excited. I guess I feel more comfortable pushing the envelope in person than in writing. This is probably why I don’t get published in HighImpact-OneWordTitle-Journals. At this conference, as in all, there are many different speaking techniques. All the talks are by professors who are doing excellent and interesting work, but they don’t always speak in the best manner. It got me to thinking about some advice for giving good talks. This is not the first time I have given advice on this topic. General information can be found here. In this post, I am talking about other aspects that I didn’t touch on previously. ***Disclaimer: The advice given here is not meant to shame any particular person. I am not talking about you. This post is only meant to give advice to help people interested at self-improvement. Up Talk, Vocal Fry, Voice Tone, Using the Pointer, Body Language: This was all discussed in detail in previous post. Here is an over view. Don’t sound like you are asking questions (no up talking). Make declarative statements. Use a lower voice, if possible. Two hands on the pointer if your hands shake. Don’t fidget – gesture. Don’t Yell Your Talk: I have noticed a number of people, mostly women, basically yelling their talk at the audience. It is like a string of words without pauses at a very loud tone. I personally, find this hard to take and a bit off-putting. I am not sure when this style got developed or taught, but I have noticed it more and more. It feels like I am being blasted by the person’s talk instead of engaging with the information. My advice: insert pauses. If you have a hard time remembering this, put things into your talk that will make you pause. A white rabbit. A small smiley face. Use these cues to remind you to pause. You need to let the audience take in the scientific information you have delivered. When you present the method or experimental system, put in a pause and ask the audience if they have questions. When you present an important result, pause and let it sink in, then state that this is remarkable or significant and why. As for the yelling tone, I think the only thing that will cure that is thought and practice. I think the yelling is caused by nervousness mostly. This is why I am surprised to see it in experienced scientists with tenure who have been doing this for a long time. You might need to practice using inflection. Inflection is not necessarily up talking. Maybe the yelling monotone comes from a fear of up talking? There are other ways of speaking with inflection that does not sound like asking a question. Instead of thinking of a talk like a public presentation, think of it as a conversation with someone who doesn’t know what you do where you have all the information with you and arranged on slides that you just happen to have up on the screen. If you design the talk this way and maybe pick someone in the audience to talk to, you might be able to blot out the fear of “public speaking” that I think could be driving the yelling. Of course, I grant that I could be exactly wrong. If you have insight as to the yelling your face off style of giving talks, please post or comment. Engage the Audience: I said this before, but here I am being more general than just using demonstrations. Also, audience engagement goes along with the issue above of having a conversation with your audience. In theater, there is a concept called “breaking the 4th wall,” where the character on the screen talks to the audience. 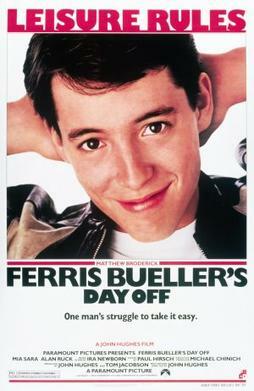 Remember in Ferris Beuller’s Day Off, when he looks at the camera and talks to you. Ferris is breaking the 4th wall. It is the invisible wall between the action going on on the screen or on stage and the audience. When you give a talk “at” an audience, you have the 4th wall up. I recommend that you try to break the 4th wall in your talk. You can walk into the audience, although that is not always sensical if you are tethered to a laptop at the front. You can also ask your audience questions. Give them a quiz. You’re probably a teacher of some sort if you are a faculty. Or maybe you aspire to be. Putting a question on a slide by itself and asking the audience to vote on the answer is a good way to engage the audience and to wake them up. Use Humor and Analogy: Some people are naturally funny. Some are not. If you are funny, try adding some humor to your talk. If you are not, I don’t advocate trying to include it. On the other hand, non-funny people can include analogies to well-known, modern, or macroscopic systems and objects to help improve understanding during your talk. A few well-placed analogies with images in your talk can go a long way to taking your talk from boring or opaque to exciting and clear. I said the same thing at the end of the last post that I am saying here, which is: I am sure there are even more helpful hints for how to give a good talk, but these are the ones that came to me just now. I realize the last post was about a year a a half ago, but maybe going to conferences makes me thoughtful about giving talks. I cannot overstate the importance of practicing, especially when you are new at giving talks. Even conference/presentation veterans practice. Anytime we drive to a conference, we bring a projector so we can project on a wall and practice. Practicing with slides blown up big is really helpful, so you can practice standing next to your talk and also so you can see how your slides look on a big screen.